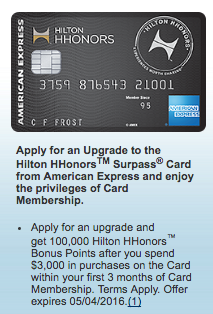 I recently logged in to my Amex account and was pleased to see an very nice upgrade offer to the Hilton Surpass card. If I upgraded my current non-fee Hilton HHonors Amex card I would get the current all-time high sign-up bonus of 100,000 Hilton points after spending $3,000 within the first 3 months. The perk on these upgrade offers? No hard pull. Currently I have the non-fee Hilton Amex card, so I assume this is targeted for Amex cardholders with the fee-free Hilton card. If you have the non-fee Hilton card be sure to log in to your account to see if you are targeted for the offer. The details on my offer stated that it was valid until 5/4/2016, if you are interested in the offer be sure to log in to your account to check. Why is this good? 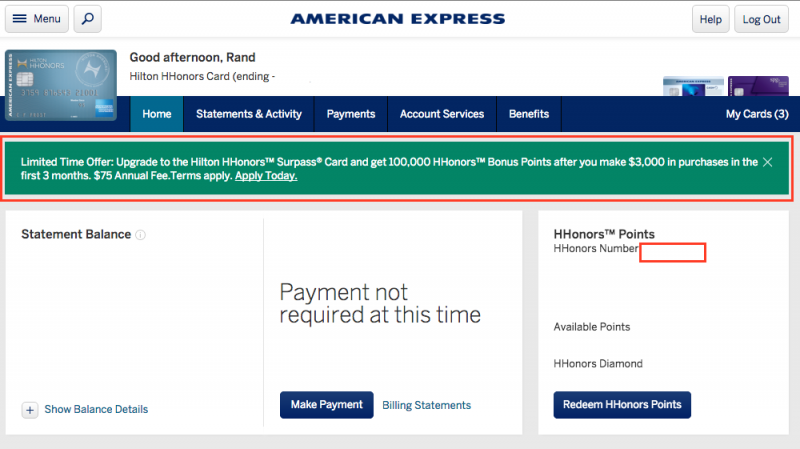 While the Amex Hilton Surpass is offering all all-time high sign-up bonus of 100,000 bonus points after spending $3,000 within the first 3 months, with an upgrade offer you (typically) don’t receive a hard pull on your credit score. This makes upgrade offers a great way to earn an additional sign-up bonus without having the hard pull show up on your credit score. If you’ve been earning miles & points long enough you know why hard pulls are valuable. Ultimately if you have too many hard pulls it can the deciding factor if you are approved for a new card or not—which can be the difference in earning the extra 50,000 miles/points from a new card offer. I decided to apply for the upgrade and clicked through the short application, basically just agreeing to the terms and conditions. After submitting I was instantly approved. Upon an upgrade you can continue to use your current card and your account number does not change. You will however receive a your new card in the mail in a week or so. Within the application you can see the terms per the 100k points upgrade offer where it says” Apply for an Upgrade to the Hilton HHonors Surpass Card… ” This is important and make sure you are on the right application page, if you apply through the normal application you will have a hard pull on your credit score. Apart from avoiding the hard pull, the offer is exactly the same as the public offer. Earn 100,000 Hilton points after spending $3,000 within the first 3 months. The card does have a $75 annual fee that is not waived, but it seems worth it to me given I am avoiding a hard pull and I just earned Hilton Diamond status through Hilton’s generous Diamond status match. If you currently have the no-fee Amex Hilton HHonors credit card then you can log in to your account to see if the upgrade is available to you. I didn’t immediately see the offer upon logging in, but after I clicked to view my Hilton card account the upgrade offer appeared above my account details. There may be other ways to try to get the upgrade offer, e.g. through the personalized offers page, etc. Let me know if you received the offer another way! Were you targeted for the upgrade? Will you apply? Anyway to get the offer if its not in your online account, I only see 50k for upgrade. Since the upgrade offer is targeted there is no way to get it unless if shows on your account. You may try to call in and ask a rep about upgrading your account per the 100k offer. If you do, keep us posted! I saw this on my account but didn’t think any of it until your post. Thanks for putting it in perspective. TTN, thanks for the datapoint! Did you also see the offer on your no-fee Hilton card page? yes, it was the top offer in both of our accounts. Do you put much spend on this xard? Wondering if that matters for who is targeted. justthebest, I haven’t put spend on the card in over a year. Not sure if spend or account age matters in this case, but it seems that many have seen the offers. I did have to click around on the Amex site before it was visible on my account page.